What are the most popular online bachelor's degrees offered in Delaware? While there are only ten four-year colleges in Delaware—only three of which offer online programs—the state has authorized certain out-of-state colleges to grant degrees to Delaware residents. Due to sagging enrollment rates among college-age residents, the state recently launched the Getting to Zero initiative. The program encourages students to apply to post-secondary schools, and aspires to reduce the number of high school graduates who don't apply to college to zero. Delaware has also added online and distance learning opportunities into its overall educational system. Three of Delaware's top colleges—the University of Delaware, Wilmington University, and Widener University—have recently introduced online degree programs. Additionally, in 1999 the Delaware Center for Distance Adult Learning was formed to help residents obtain their high school diploma or GED online. Online colleges in Delaware have provided vital resources to residents who are interested in college, but discouraged by rising public tuitions. Between 2006 and 2011, in-state tuition rose by 41.8 percent while state appropriations fell alongside at a rate of 8.6%. Taken together, these factors have spurred interest in online education, where costs are generally lower. Wilmington University provides an inclusive academic experience that emphasizes innovative learning led by expert faculty. The nonprofit research institution promotes a student-focused environment, both face-to-face and online. The leader in online colleges in Delaware, Wilmington University offers 90 fully online degree and certificate programs, and each program's flexible online curriculum caters to students with diverse educational backgrounds. Up to 90 transfer hours can be applied toward an online degree, and students can convert prior training into earned credit. The university's undergraduate tuition rates are competitively priced, and online students pay the same as traditional students. Active duty military students receive a significant discount toward tuition. Prospective students can take a free online course to determine if online learning is a good fit. Online student navigators are available to assist distance learners, and students can chat with a navigator from 8-11PM on specified days. Delaware State University, established in 1891, is a Historically Black College. The school offers several online undergraduate programs, including accounting, criminal justice, psychology, and public health, as well as four graduate degrees, which makes DSU one of the leading online colleges in Delaware. At DSU, online courses are offered in a few different forms. Many of the online classes follow an eight-week, accelerated format, which allows students to work through one asynchronously delivered class at a time. There are also on-campus classes that are web-enhanced and blended classes that combine online and on-campus elements. For admission into any programs at DSU, applicants must have minimum ACT scores of 17 and minimum SAT scores of 800. New students and transfer students must also have at least a 2.0 GPA in previous college coursework. Online students at DSU are provided with a number of resources for employment, academic assistance, and finding internships. The University of Delaware has a history that dates back to 1743 and is the largest university in the state. UD is also one of the leading online schools in Delaware, with an online degree in nursing that has been available through distance education since 1993. The online BS in nursing, like other programs, is offered year round. Online programs at UD combine asynchronous study with real-time interactions. Online students are never required to visit the Newark campus, but learners who live in the area can take tests at any of the UD campuses or Delaware testing centers. Out-of-state students can set up local placement and testing sites. Transfer students are eligible to bring in up to 59 credits that were earned with a minimum 2.5 GPA. Online students are permitted access to the online library and other academic and professional resources. Tuition costs in Delaware have increased in recent years, and state spending for education has decreased alongside. In-state tuition for public and private universities increased by 41.8% and 20%, respectively, in the last five years; total state appropriations for higher education decreased 8.6% during that time. In recent years, Delaware has launched several initiatives to expand higher learning programs in the state. Governor Jack Markell joined forces with the College Board to pursue key initiatives such as “Getting to Zero” and “Pathways to Prosperity.” “Getting to Zero” aims to eliminate the percentage of college-ready students who do not take advantage of college application opportunities in the state (currently 18% don't), while “Pathways to Prosperity” prepares high school students for specialized training toward earning a degree and securing employment in Delaware. 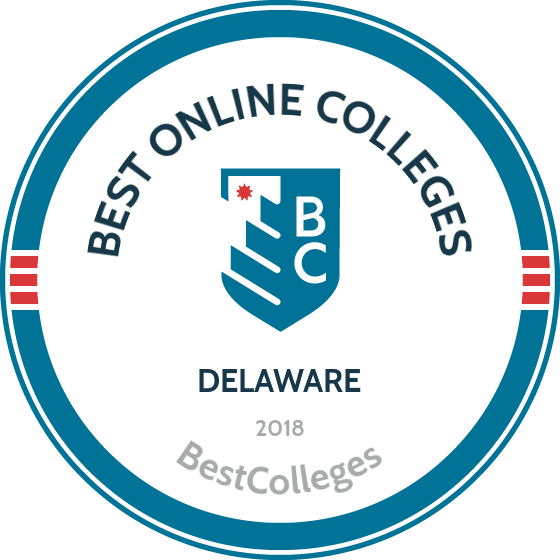 Browse our list of the best online colleges in Delaware for more insight into distance learning programs in this state. Delaware's higher education agencies aim to promote online learning in the state through several key initiatives. Secondary school students may choose from a variety of district-sponsored online courses and programs through Delaware's K12 project, some of which are offered free of charge to students. The state facilitates additional distance learning opportunities for college students as well as other adult learners through the Open Education Database (OEDb) and the Delaware Center for Distance Adult Learning.The majority of Delaware's postsecondary institutions, including the University of Delaware, Wilmington University and Delaware Technical Community College, offer fully online delivery options. Employment growth in this profession is moderate in Delaware. According to the Delaware Department of Labor, long term projections show an increase of 15% in the total number of jobs between 2014 and 2024. Wages increased by 12% from 2011-2016. In Delaware, what were the top careers in 2016 for people who had a degree in business administration and management? Data source: Delaware Department of Labor, Bureau of Labor Statistics. Data may not be available for every year. Employment growth in this profession is strong in Delaware. According to the Delaware Department of Labor, long term projections show an increase of 150% in the total number of jobs between 2014 and 2024. Wages increased by 3% from 2011-2016. What were the top careers in Delaware in 2016 for people who had a degree in criminal justice/law enforcement administration? In Delaware, what were the top careers in 2016 for people who had a degree in psychology? Employment growth in this profession is strong in Delaware. According to the Delaware Department of Labor, long term projections show an increase of 27% in the total number of jobs between 2014 and 2024. Wages increased by 16% from 2011-2016. In Delaware, what were the top careers in 2016 for people who had a degree in information technology? Currently, no schools in Delaware offer an online degree program in information technology. Employment growth in this profession in Delaware is strong. According to the Delaware Department of Labor, long term projections show an increase of 25% in the total number of jobs between 2014 and 2024. Wages decreased by 2% from 2011-2016. In Delaware, what were the top careers in 2016 for people who had a degree in marketing/marketing management?